Go See The Fleagles!! Free! Sunday in L.A. 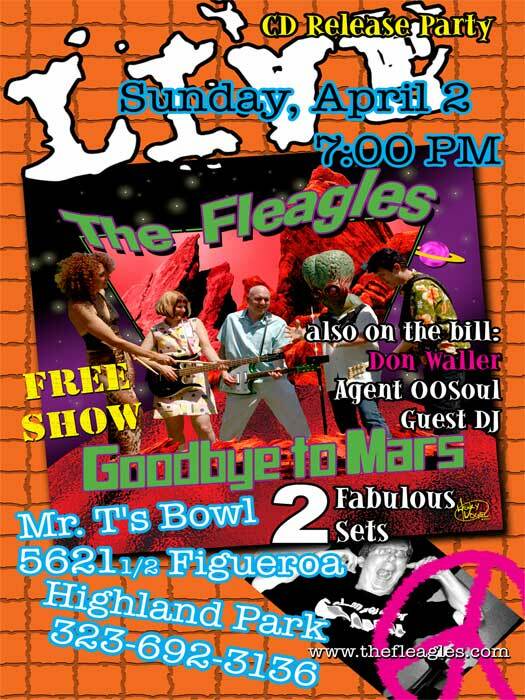 The Fleagles will be celebrating the release of their new CD “Goodbye to Mars” this Sunday 4/2 at Mr. T’s Bowl with a free show. 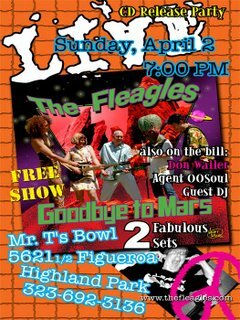 The Fleagles will be playing two sets, and in between DJ Don Waller, Agent 00Soul, will be spinning the platters. Directions: Take the 110 freeway northeast from I-5. Get off on Ave 52 exit, go left. Right on Figueroa. Park in parking lot behind Mr. T’s and enter from the back.